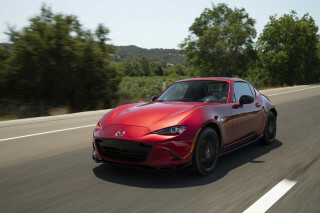 If you're having trouble finding a BRZ at the dealership, go ahead and try the Toyota showroom instead; through different supply agreement with their respective parent companies, Toyota is getting more than twice as many nearly identical Scion FR-S models than Subaru is getting BRZs. The 2013 Subaru BRZ shows that simplicity and leanness can provide more driving thrills than complex, high-horsepower sports cars costing several times as much. The all-new 2013 Subaru BRZ is a purist's sports car—light, lean, and more focused than any affordable sports car on the market today. 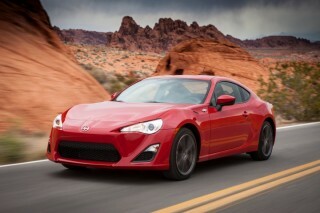 The only exception, perhaps, is the nearly identical Scion FR-S that you'll find over at Toyota dealerships. With the BRZ, you don't need to worry about feeling detached from the driving experience; it's a back-to-basics sports car in some senses, yet it has a modern high-tensile-strength-steel structure, all the necessary modern safety features, and amenities like Bluetooth, iPod controls, and a standard touch-screen navigation system. And it's quite simply a hoot to drive, with its steering, handling, and low-slung, seat-of-the-pants driving feel a big part of it. Communicative, quick-ratio steering, combined with suspension settings that are taut but just compliant enough allow you to enjoy the tight corners, read the road surface with your hands, and get a sense of where the BRZ's dynamics are headed before the tires lose adhesion. Power won't be a strong point for those who have test-driven some of the heavier sports cars with turbocharged engines or big V-8s, but the 200-horsepower, 2.0-liter horizontally opposed ('boxer' or 'flat') four-cylinder engine can squirt you eagerly from corner to corner provided you keep it revving high. The precise, short-throw six-speed manual is what we recommend, but those who want an automatic won't be let down by the six-speed auto, with its steering-wheel paddle shifters, sport mode, and downshift rev matching. 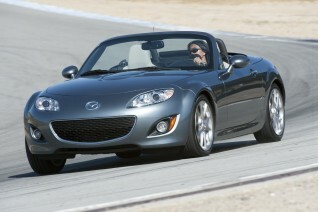 But the reward of the light construction and small engine is great fuel economy—up to 34 mpg highway. The BRZ is going to be a popular choice for weekend track excursions, and for that there's not only a DSC Sport mode for the stability control but also a full-off mode. A Torsen limited-slip differential also helps give the rear wheels surer footing out of corners either on the track or on tight, curvy roads. Taller drivers will even be able to fit a race helmet on, and the rear seatback folds forward to fit extra wheels or gear. Unfortunately, the BRZ isn't all that comfortable or versatile beyond that. While the ride feels fine on the backroads or around town—and we like the rather upright driving position—it tends to get a bit busy and noisy on pockmarked freeways, and the front seats are a bit too firm and could use more adjustability. Trunk space is good enough for a carefully packed weekend trip, but the load opening is quite narrow. And those back seats you see? They're just a tease, and only good for a child seat...maybe. The BRZ is already proving the worth of Subaru's lightweight ring body structure, which takes advantage of high-tensile-strength steel; it's been named an IIHS Top Safety Pick, with top 'good' ratings across the board in the agency's crash tests. Considering the engineering and focused performance capability you get with the BRZ, it's pretty impressive that this sports car starts at $26,265. But a look at the BRZ's feature set makes it all the more impressive. Most notably, a touch-screen navigation system comes standard, but we wish its fussy audio controls were a bit easier to access. Again considering the price, it's all quite forgivable, and we tend to think of this small Subaru as one of the performance bargains of the decade—and, perhaps, an instant classic. The 2013 Subaru BRZ has classic head-turning sports-car proportions on the outside, along with some inspiring details inside. The 2013 Subaru BRZ is an all-new sports-car, and it combines some classic 2+2 sports-car proportions with modern styling details. On the inside, it's the same; the instrument panel follows a simplified cockpit, with rather basic materials, but special details and textures keep it interesting. With its relatively long hood; long, arched roofline; and sculpted flanks, with fender lines that flow around to the rear trunklid and spoiler, the BRZ has classic sports-car proportions from the side, and showy five-spoke wheels complete the look. 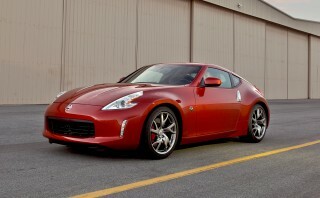 From the front you'll probably find its hood exceptionally low—punctuating its very low engine mounting and low center of mass—with the low grille only below the bumper and headlights that spread wide into the fenders. Those headlights are about the only styling element that the BRZ has in common with Subaru's other cars. In back the look is more complex, with some of the headlight design echoed in the taillights but with carved-out sheetmetal in the middle, along with a blacked out rear valance, with twin pipes plus lights in the middle. The only things that are a little harder to warm up to are the side fender vents just ahead of the doors; even from ten feet away, they look like a Pep Boys add-on, and badging (like what the nearly identical Scion FR-S gets) could have avoided that eyesore. Inside, we like the basic, down-to-business cockpit look, and how a few of the controls follow industrial inspiration—with the nut-and-bolt design of the climate-control knobs, for instance, or the textured material that looks like corrugated metal surrounding them. Some of the materials used could have been more exciting, though; in front of the passenger seat is a large, continuous slab of light-silvery-colored plastic (more of the soft grained material would have been better), which doesn't quite match the more metallic trim alongside the center stack. Provided you value handling over straight-line performance, the 2013 BRZ is one of the most engaging and fun-to-drive sports cars on the market. The BRZ is first and foremost a sports car—and a very light, simple, focused one at that. So it follows that this little 2+2 coupe is a hoot to drive, especially when the road becomes tighter and curvier. Power comes from a Subaru horizontally opposed 'boxer' engine, making 200 horsepower from 2.0 liters—with no turbo, but fitted with Toyota direct-injection components. With its rev-happy power characteristics and relative lack of low-rpm torque (it makes its peak 151 pound-feet at a high 6,600 rpm) this is not a powertrain that bring blistering straight-line acceleration, but keep the engine spinning and you'll be happily squirting out of one corner and on to the next. In the 4,500-rpm to 6,500-rpm range, power builds quickly, and the somewhat ordinary four-cylinder intake sounds yield to a tenorous, pulsating bark that does indeed sound like WRXs that have received the tuner treatment. Both of the transmissions in the BRZ do a good job in keeping it fun and keeping the revs up when needed, but it's the precise, short-throw six-speed manual that we recommend. 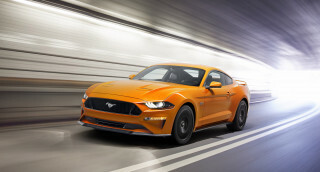 Those who want an automatic won't be let down by the six-speed auto here either, as it includes a sport mode that sharpens shifts, delays them, offers steering-wheel paddle-shifters, and even gives you a rev-matched throttle blip when you manually downshift. Also, with the automatic and sport mode, manually select a gear and it holds it, even at full throttle—a detail that enthusiasts will appreciate. “Pure handling delight” was the mantra during the BRZ's development, and its exceptionally low center of mass (one of the lowest of any mass production car) and 2,800-pound curb weight speak to that. Handling and body control are confidence-inspiring and extremely predictable. With low-mounted struts and coil springs in front, plus a front brace, and a double-wishbone (multi-link) setup essentially adapted from the STI, the BRZ is tuned to scrub speed off at the front wheels first and transfer its weight cautiously back to the tail when the driver pushes it. You can edge the tail out under power, but you have to make an effort to do that with revs and a heavy right foot. And quick-ratio steering gear manages to carry a lot of road feel through to the steering wheel. The BRZ is going to be a popular choice for weekend track excursions, and for that there's not only a DSC Sport mode for the stability control but also a full-off mode. A Torsen limited-slip differential also helps give the rear wheels surer footing out of corners either on the track or on tight, curvy roads. 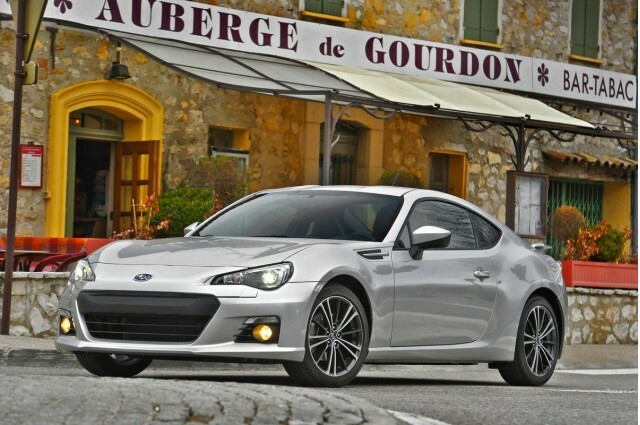 The 2013 Subaru BRZ isn't such a good choice if you do long freeway drives, or value comfort. And think of it as a two-seater—that backseat is just a tease. Focused sports cars often end up sacrificing some comfort and usability in favor of better dynamics, lighter curb weights, and stronger performance—and the 2013 Subaru BRZ is no exception. While the BRZ isn't exactly roomy, it's spacious enough for two and weekend bags, and comfortable enough for a commute or a jaunt out on the backroads; although we can think of many better choices for a long plod on the Interstate. The BRZ offers up a reasonably good driving position—a little more upright than most other sports cars—with seats that are firm and pretty well bolstered. In Limited models, there are slightly upgraded bolsters as well as Alcantara (suede-like) trim. There is a back seat, but this is strictly a 2+2; adults aren't going to be able to get into it easily, or even manage to wedge their legs behind the front seat. From the side or even the back, the BRZ looks like it could be a hatchback, with its long, sloping rear glass, but there's actually a small trunklid; it helps keep the body structure stiff, but results in a narrow load opening. That said, there's quite a bit of space back there—enough for a couple of laptop bags and a small suitcase. Subaru also says that with the rear seatbacks folded forward (and using the pass-through), you can load four race tires plus tools. And in a nod to one common issue for taller drivers who weekend race, there's an abundance of headroom—enough for getting the helmet on, and being comfortable with it. Overall, if you're about average height or shorter, you might find the BRZ's seats to offer decent enough support for a longer trip. But taller drivers will find their legs splayed out, against the center stack, with the lower cushions feeling all too firm after a few hours. The seats are also missing the kind of middle-back support that's quite common even in inexpensive cars now, the short lower cushions could be more workable if they were more adjustable. There’s really no such thing as feeling detached from the driving experience in the Subaru BRZ, and while that’s mostly a good thing, it turns into a burden at those times when you would rather shut off your inner racer for a few hours and set the cruise control. Unless you’re on a nearly perfect highway surface, the BRZ tends to bound up and down with highway patchwork, and although it tracks straight and you’re seldom pushed off course, the experience can be fatiguing. Otherwise, 'simple is good' holds for most of the BRZ's interior and its controls and displays. We also found the orange-red displays and instrument needles to be very easy to read with polarized sunglasses. About the only ergonomic issue we had was with the mandatory touch-screen system for audio and navigation. For some audio functions it leaves you reaching for small 'buttons' on the touch-screen that can be much harder to find quickly than the real thing. The Subaru BRZ handles well and has a full roster of safety equipment--plus it's one of the only sports cars that's an IIHS Top Safety Pick. Since the 2013 Subaru BRZ is an all-new model, built with an entirely new structure, we can't yet verify its standards for occupant protection. But Subaru emphasizes that the BRZ's structure does have safety as well as weight savings in mind, with a structure that extensively uses high-tensile-strength steel and borrows the safety-ring structure that's used in other models from the brand. So far it's already proven itself well, as the BRZ has already earned Top Safety Pick status from the Insurance Institute for Highway Safety. In addition to a multi-mode stability control system, four-channel ABS, electronic brake-force distribution, Brake Assist, and Brake Override are all included, and although the BRZ doesn't have all-wheel drive like the rest of the Subaru lineup, we'll wager that its responsible and predictable handling is bound to be an asset in accident avoidance. For a sports car, outward visibility is reasonably good in the BRZ—thanks to a reasonably low beltline and plenty of window space. The 2013 Subaru BRZ is offered in only a few build combinations, but its reasonably well-equipped, and navigation comes standard. Considering the engineering and focused performance capability you get with the BRZ, it's pretty impressive that this sports car starts at $26,265. But a look at the BRZ's feature set makes it all the more impressive. 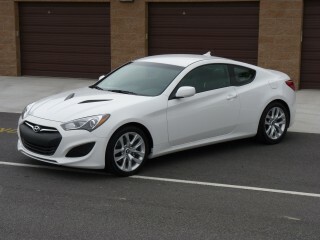 With either the manual or automatic transmission, the 2013 BRZ can be had in Premium or Limited models. BRZ Premium models—and all BRZs—include a touch-screen navigation system that's integrated with eight-speaker sound; Bluetooth hands-free and audio connectivity; and iPod controls. A trip computer, rear defroster, variable intermittent wipers, leather shifter and parking-brake trim, and power windows, mirrors, and locks are all included as well. The Limited models gain upgraded seat bolsters, heated seats and mirrors, a rear spoiler, dual-zone climate control, fog lamps, and a keyless start system—and altogether sticker at just under $30k, even with automatic. Options are limited to a few port- and dealer-installed accessories. We found the touch-screen system—which is only marginally better than most aftermarket systems—to be a bit frustrating at times as there are no steering-wheel buttons, and there's no way to select audio other than with tiny 'buttons' on the touch screen; but it does allow a split-screen view to see audio and the map/navigation view simultaneously. If you want a sports car but can't bear the thought of guzzling gas, there's no need to shy away from the Subaru BRZ. 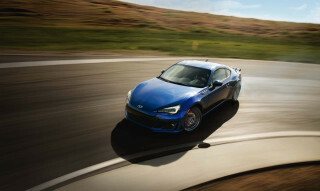 The 2013 Subaru BRZ is tuned for performance above nearly all else. So it might come as a little surprising that it achieves Combined EPA ratings of up to 28 mpg—and up to 34 mpg on the highway. 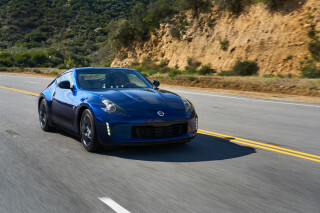 Thanks in part to the Toyota direct-injection system that it's fitted to; its light 2,800-pound curb weight; and its relatively tall high-gear overdrive (2,300 rpm at 70 mph with the automatic), the BRZ is surprisingly fuel-efficient, especially on the highway. BRZ models with the automatic transmission are rated a bit higher (25 mpg city, 34 highway) than those with the six-speed manual (22/30)—in part perhaps because the manual is geared a bit lower. But even more impressive is that in a first drive of an automatic BRZ, including about 280 miles of varied conditions—none of it steady or sedate—we saw an average 30 mpg. One note for those interested in pinching pennies: The BRZ requires premium fuel. 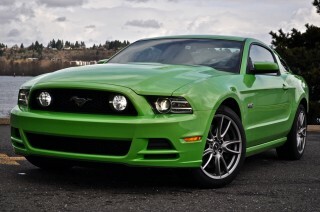 Great car, extremely reliable and fun to drive. The BRZ is FUN TO Drive. It is reminiscent of the British sports cars such as MG, Triumph and Austin Healy - cars that a young person could afford and be reasonably safe. 10x as reliable and likely much safe... The BRZ is FUN TO Drive. It is reminiscent of the British sports cars such as MG, Triumph and Austin Healy - cars that a young person could afford and be reasonably safe. 10x as reliable and likely much safe in a crash. Looking for a different year of the Subaru BRZ?